As Zig Ziglar once said: “If you can dream it, you can achieve it” claiming that everything is possible with a goal in your mind and actions in reality. So, have you ever wished to start the business and create your own web store? But you didn’t have any idea how much you need to invest for its launch, right? That is why in this article we are going to provide you with the related information to give a clue about the approximate sum of money demanded to start e-shop. There is no doubt that many factors influence on the price of e-Commerce website as everything depends on your taste and requirements. Moreover, you have to pay attention to technology solutions going in step with the times and making a great contribution into the profit-making success. 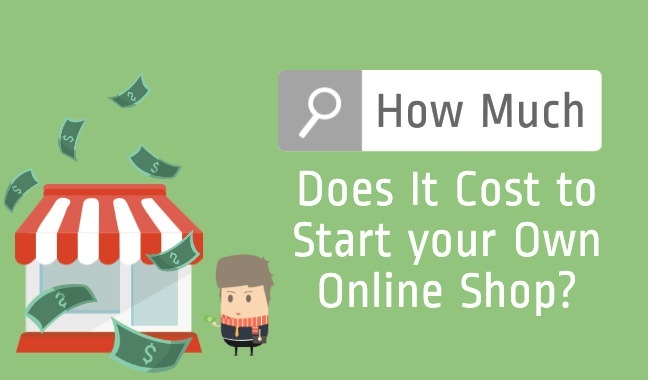 It means that the cost of web store is going to depend directly on your needs and budget. Today we want to highlight points to consider when you make a research for online store creation. Variety of platforms can turn your brain for sure as each solution offers a set of opportunities, and its functionality is specified by the price. There are many shopping carts that do not require much efforts to establish the store and manage the further activity as well. Therefore, one man's meat is another man's poison, so choosing suitable platform can be not an easy task that even defines the future business success. Hence, there are three main types of shopping carts: hosted, standalone and CMS-based. What is the difference between them considering functionality and pricing plans? + Easy and quickly to set up. Only a few minutes are needed to create a new store with a full set of features. Also, you don’t have to search for a hosting provider as everything is included in the cost. - Core code is limited for access, so there is not much space for customization. Most popular hosted shopping carts include Shopify (from $29/month to $179/month), Bigcommerce (from $24,95/month to $299,95/month), 3dcart (from 19,99/month to $129,99/month) and Volusion (from $15/month to $135/month). Although, there is a hosted solution that stands out from the crowd - PrestaShop Cloud. It’s a freshly released version of a regular PrestaShop platform that offers its functionality and hosting for precisely nothing! Thus, PrestaShop Cloud is a single hosted solution on the market that is absolutely free. + Absolutely free for installation. Customizations are possible for anything you want. Moreover, you can choose the hosting provider that exactly meets your needs. - Some solutions may require higher level of programming skills to modify the core code. Thus, although standalone platforms are free to download and install, you need to pay for hosting server and have at least basic programming expertise. Otherwise, you can ask a web development company to establish your store starting from about $3,000 for a basic variant. + A possibility for any website owner to become a businessmen in a few clicks. Unlimited content management possibilities can be a good addition to a rich functionality of solution. - Some limitations can be set for retail activity. In most cases, CMS plugins are free, such as WooCommerce or WP e-Commerce. Nevertheless, there are paid CSM solutions also, for example WordPress eStore Plugin which costs $50.Some of the retail activity limitations can be removed with the help of extensions, that can be either free or paid. Hosting – $50 to $200 a year (depending on traffic & hosting services), if you choose open source solution (standalone platform). Web planning, design and development time – 60 hours and up. 3rd-party integrations - besides free ones, some of the integrations require a small fee (from $5 to $300) or annual license (from $20 up to $1,000+). Continued website maintenance – $500 a year and up (depending on number/type of updates required). Most part of available e-Commerce solutions has galleries with a diversity of templates that can be applied to your web store effortlessly. There are various eye-catching free as well as paid designs, however, the probability that the same theme will be used by hundreds of stores is really high. So, if your budget and time for launch are limited, it can be the best and the easiest option. In case you decide to buy a premium theme, expect to spend up to $250 and $1000-2000 for minor changes. And when your choice goes to custom design, be ready to pay a price that starts at $10 000 to make the store unique and striking. Essential part of online shopping is checkout procedure with preceding the payment for a purchase. So, don’t forget to provide your customers with a convenience to fee using various gateways. Your task is to connect the bank account and clients’ credit cards accounts. Platforms and payment gateways are typically low-cost considering an upfront investment, but ongoing transactional fees can range between 1% and 5% based on volume. Advertising the store and driving traffic together with sales is also issue that requires some expenses. Make a marketing analysis calculating an average cost per visitor comparing with other e-shops. Use Google Adwords to estimate it for the key phrases of Google search made previously. Its for you to decide who much money to spend on marketing - from $1 a day up to hundreds - the sky’s the limit Attracting customers is impossible without promotions, specials and other marketing tricks until you become a well-known brand with a good reputation and dozens of loyal clients. As well as marketing, you have to notice the price of provided service via phone, online chat and email. Don’t forget about managing inventory and suppliers service, taxes collecting and analyzing website KPI to convert visitors into customers. The minimum cost of CRM is $12 a month for a basic plan. In a conclusion, we may estimate that the the cost of a small-business store establishment starts from hillarious $10 (PrestaShop Cloud with free hosting + free theme + $10 domen + minimum technical skills) with no extensions installed. On contrast, you may end up with setting a store for $30,000 and even more, depending on requirements and business size. If you already have your online shop, but current solution does not provides all needed possibilities, use Cart2Cart to solve the problem. Perform migration to any of 60+ supported solutions and built a successful business.